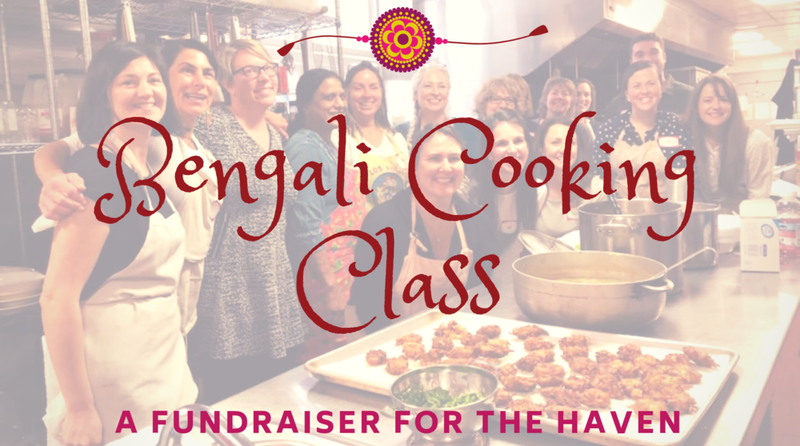 Take a Bengali cooking class at The Haven with Mahabuba Akhter. Mahabuba and Madhuporna have a passion for sharing their native cuisine and serving their community. Join them along with fellow cooking enthusiasts inThe Haven kitchen to learn to prepare an authentic Bengali meal and then enjoy lunch together! All classes start at 12 noon and finish at 2:00 pm. Participation is limited to 12 people. The class fee is $20 per person, and all proceeds go to support The Haven. Menu: Luchi (Fried flat bread, Allur Dum (potatoes with onions, garlic, ginger, and spices), Rice Pudding. Menu: Plain basmati rice, Pink lentils with green mango soup, Eggplant Fry, Allu vorta (spicy smashed potatoes). Menu: Spicy shrimp with lots of onion, Rice with coconut milk, Cabbage with sweet peas. Menu: Lamb curry, Palou (rice pilaf with ghee), Tomato Chutney. When registering, please write the date of the class you will attend in the comments box. Note the system will only allow you to register for one date per transaction.